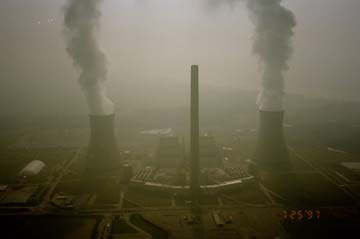 AEP’s Rockport power plant has become uneconomic to operate of late but since it uses coal, a plan by the Energy Department is designed to use a World War 2 era regulation to make sure that it keeps operating even if it requires higher rates for customers just so Trump can keep his campaign promise to revive the coal industry. Photo © 2003 BlairPhotoEVV. Although the memo describes a planned Energy Department directive, there was no indication President Donald Trump had signed off on the action nor when any order might be issued. The document, dated May 29 and distributed Thursday, is marked as a “draft,” which is “not for further distribution,” and could be used by administration officials to justify the intervention. While administration officials are still deciding on their final strategy — and may yet decide against aggressive action — the memo represents the Energy Department’s latest, most fully developed plan to intervene on behalf of coal and nuclear power plants, pitched to the president’s top security advisers. Energy Department representatives did not respond to an emailed request for comment. “Too many of these fuel-secure plants have retired prematurely and many more have recently announced retirement,” only to be replaced by less-secure, less-resilient natural gas and renewable power sources, the memo said. Over dozens of pages, the memo makes the case for action, arguing that the decommissioning of power plants must be managed for national security reasons and that federal intervention is necessary before the U.S. reaches a tipping point in the loss of essential, secure electric generation resources. U.S. Defense Department installations are 99 percent dependent on the commercial power grid, one reason that electric system reliability is vitally important to national defense and homeland security, the memo asserts. For two years, the Energy Department would direct the purchase of power or electric generation capacity from a designated list of facilities “to forestall any future actions toward retirement, decommissioning or deactivation,” according to the memo. The proposed Energy Department directive also would tell some of those facilities to continue generating and delivering electric power according to their existing or recent contracts with utilities. American power generators are expected to retire — or announce the retirements of — 16,200 megawatts of coal-fired and 550 megawatts of nuclear plant capacity this year, according to Bloomberg New Energy Finance. Nationwide, BNEF said, two dozen nuclear plants — representing nearly 33 gigawatts — are either scheduled to close or probably won’t make money through 2021. The issue is a priority for some of the president’s top supporters, including coal moguls Robert E. Murray and Joseph Craft of Alliance Resource Partners, who donated a million dollars to the president’s inauguration. The move would be one of the most direct efforts by Trump to make good on campaign promises to revive the nation’s shrinking coal industry. Trump administration officials have contemplated action for more than a year. After the Energy Department conducted a reliability study last year, Energy Secretary Rick Perry proposed a rule that would have compensated coal and nuclear plants for their ability to store months’ worth of fuel on site. Federal regulators shot down the idea in January. That didn’t quell requests for help. A FirstEnergy Corp. subsidiary requested immediate intervention from Perry’s agency in late March. That plea followed the Akron, Ohio-based company’s announcement to shut three nuclear power plants that feed the grid operated by PJM Interconnection LLC, the largest in the country. FirstEnergy Solutions filed for bankruptcy within days of its emergency request. Opponents of the new plan contend bailouts are a solution in search of a problem. They argue there are many ways to back up the grid that won’t cost ratepayers billions of dollars. A coalition of natural gas and renewable power advocates told Perry that “power plant retirements are a normal, healthy feature of electricity markets,” and therefore there is no emergency that would justify Energy Department action. Representatives of FirstEnergy did not immediately respond to emails seeking comment. Invoking national security concerns could bolster the Trump administration’s case in any legal challenges over the intervention, said Ari Peskoe, director of the Electricity Law Initiative at Harvard University. “It’s going to be tough to get a court to question DOE’s factual finding — particularly if it relates to national defense,” Peskoe said in an interview. Tapping two statutes simultaneously also could give the administration more “legal room,” Peskoe said.